Now that I’m done hosting Grand Rounds, I have time to start looking again for the perfect job. I’m heartbroken because the man of my dreams, Steven Jobs, never contacted me about a job, or my new iPhone. By the way, Steven, the offer is still on the table, so call me. Poor Vonnie, it must be tough being in love with someone when you are betrothed to someone else. Personally, I think Vonnie is better off without Dr. Greer. He sounds like he has some major codependency issues, and I think that Vonnie would be happier living with a man who doesn't have emotional baggage. Dr. Greer needs to attend some Alonon meetings, and I hope that he dumps his raging alcoholic girlfriend. She is only going to bring him down. Someday Dr. Greer will thank me for my advice. Vonnie, call me if you quit your job after you get married. I’m a great psychiatric nurse, and I am willing to relocate to Waikiki. I can get use to living in paradise. My name is Ramprekash, I have a blog for acupressure.http://my-acupressure.blogspot.com which has google page rank 4. I like your site. I would like to have a link exchange with your site which helps both of us.you can paste the code of my site which is given in the left side of my site.if interested please mail me to sree1280@yahoo.com. Thank You. 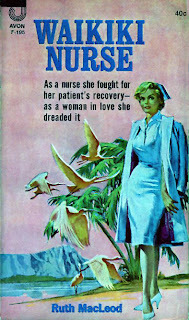 Hahaha as a traveling nurse I was a Waikiki nurse! It was awesome. If I was still young and didn't own my own home I would still travel. it is the only way to see the sights! Oh, Ms. Poody, I'm so jealous of you! The next time you want to go back there, just let me know. You can show me the sights. Ooh reserve another air ticket on that flight! I could use some rest and relaxation. The rats in my ivory tower are starting to get nippy.